Many horse racing fans find that there's nothing to compare to watching powerful, graceful horses on the race track. Regardless of whether or not the visit involves betting on the horses, it's a thrill to gaze at the magnificent animals as they pound around the track. It's an activity that can be shared. 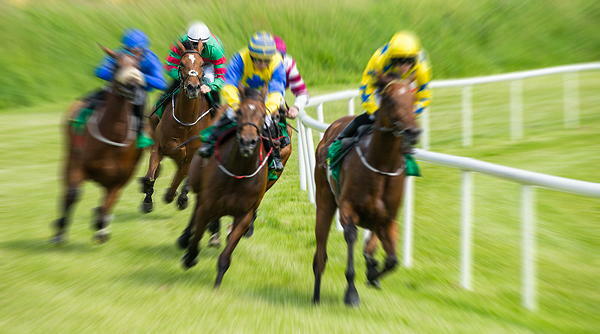 Horse racing enthusiasts can attend horse races with their families and friends who share their anticipation and excitement in watching the horses compete. It's affordable. You don't have to place massive amounts of money on the horses to enjoy the race. In fact, you don't have to place any bet at all, though most people do so for the fun. Tickets are relatively low-cost and even if you've bet a small amount, it's fun to look forward to walking away with a little extra cash in your pocket. You can enjoy the sport in-person or online. It's not one of the fun online games that you'll find at an internet casino but a sporting event that you can watch in real time. You also have the opportunity to connect with other racing fans on Facebook, Tumblr, Twitter and Instagram as you share your enthusiasm with other like-minded aficionados. Some people enjoy a local race where dress is casual and the atmosphere is homey but others look forward to the big racing events. Britain is known for hosting some of the world's most prestigious racing events. If you're prepared to put on a top hat and waistcoats or, for the ladies, formal day wear, you'll be welcome. Each of the big British horse races is held at a pre-determined time of year. Some of these traditional race seasons have been enshrined in the British high society calendar for hundreds of years. The Royal Ascot is probably the best known horse race in the world. The Ascot season is held over the course of twenty-six days of eighteen flat meetings. Ascot opens in May and the races run through October. During the winter months there are jump races. The most impressive event is the Stayer's Triple Crown which includes competitions for the Gold Cup, the Queen's Vase and the Royal Hunt Cup. These events are held in June and are famous because members of the Royal Family attend these meets. Ascot is a quintessential English sporting and social occasion. It dates back to 1711 and includes a pageantry of horse-drawn royals who arrive in front of grandstands that are packed with high fashion ladies and gents. The crowd then views top-class racing events that include the prestigious Gold Cup. The 2018 Royal Meeting will take place June 19-23 at Ascot in Berkshire. Ascot hosts the King George VI and Queen Elizabeth Stakes which will take place on July 28th this year. This 1-mile, 4-furlong long track is Britain's most prestigious open-age Flat race for horses aged three years or older. The King George VI and Queen Elizabeth Stakes are part of the Breeder's Cup Challenge and the winner earns an automatic invitation to compete in the Breeders' Cup that occurs later on in the year. The St. Leger is the oldest of Britain's five classic races. It dates back to 1776 and involves runs of a distance of 1 mile, 6 furlongs for three-year-old thoroughbred colts and fillies. The St Leger is the final leg of the Triple Crown which includes the UK 2000 Guineas and also includes the Derby. It also completes the Triple Crown for Fillies along with the Oaks and the 1000 Guineas. The 2018 race will take place on September 15th in Doncaster. The Oaks, held in Epsom, is Britain's richest horse race. It's thought to be the most prestigious of the Classics and is one of the highlights of the British sporting calendar. The one-mile, four furlongs race is held on the Downs at Epsom. The Group 1 flat horse race is open to three-year-old fillies. The Oaks 2018 race is scheduled to take place at Epsom Downs on June 1st. The 2018 Irish Derby will be held at the Curragh in County Kildare in Ireland on June 30th. The Irish Derby is held 3 weeks after the British Derby and is open to three-year-old thoroughbred colts and fillies who run on turf over a distance of 1 mile and 4 furlongs. Entrance is free. The competition is staged on the second day of Curragh's three-day Irish Derby Festival meeting. Horse-racing in Great Britain is a national obsession for bettors and observers alike.